One of the many questions users who switch from Windows to Linux have is how to compile C/C++ sources and what IDEs (Integrated Development Environment) Linux has to offer. Most of them study C or C++ at school or home and are usually used from Windows with an IDE like Dev-C++ or Code::Blocks. In this article I'll give a few explanations on how to compile software for studying purposes on Linux (and particularly Ubuntu), what are the most common ways, what I consider to be the most effective method and which are the most popular applications to use for programming in those languages. I'll divert a little to say that Dev-C++, although a wonderful IDE on Windows, is no longer maintained, and even though a port used to be around for Linux, it was abandoned too (as far as I know). Instead, for those who would like a replacement which works and behaves the same way, I can warmly recommend Code::Blocks, which has an actively maintained port and it's easy to compile and install. According to the details I could find on #ubuntu @ Freenode, Code::Blocks will also be included in the Intrepid Ibex (the next Ubuntu release) repositories, in universe. build-essential is a meta package - a package which only depends on other packages, so installing it will automatically install several tools like gcc, g++ and make. This is the simplest way of creating and compiling C or C++ code. Regarding more complex, powerful IDEs, you can try Vim, Emacs (which can be run both in CLI mode using emacs --no-window and in GUI mode) or even the user-friendly Nano. Nano can be configured by editing (or creating if it does not exist yet) the ~/.nanorc file, where ~ is your home directory. The global configuration file is located in /etc/nanorc. Also, you can read this tutorial on how to enable syntax highlighting in Nano. Among the good editors which use a graphical interface are Kate, Gedit, Geany, KDevelop, Anjuta, Code::Blocks or Eclipse. These are not all though, but I recommend trying those first and see which one fits. I'll briefly review some of them below, so you can have a general idea about each of them. Its name means KDE Advanced Text Editor, but Kate is definitely not only a text editor. It supports highlighting in many languages, indentation, spell-checker, block selection mode, and it's highly configurable. Kate comes by default in Kubuntu or can be installed using sudo apt-get install kate. This is the default text editor in GNOME. It can be used as a simple IDE too. It comes installed by default in Ubuntu. Yet another editor written in GTK. It's pretty light and includes the most common features an IDE should have, so it's a good alternative to Gedit. This is the KDE advanced IDE, offering the tools and advanced features of a full IDE. I recommend starting with a text editor rather than using this one for studying purposes. However, if you especially want to develop KDE applications, KDevelop is the way to go. This is the powerful port of Code::Blocks for Windows, using the wxWidgets interface. In my opinion it's very fit for studying C/C++ on Linux. Although not included in Hardy Heron, Code::Blocks will be included in the Intrepid Ibex repositories. Notice: It is also a good idea to install xterm (a terminal application just like GNOME Terminal or Konsole), since Code::Blocks uses it to show the output of your programs. This should do it. You can run Code::Blocks by typing codeblocks in a terminal or pressing ALT+F2 and writing codeblocks in the run dialogue that appears. Written in GTK, Anjuta is a powerful development environment for C and C++, which also allows you to create GNOME applications. 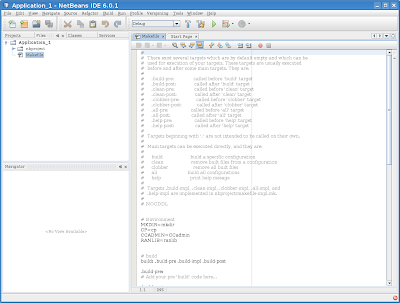 NetBeans is an advanced IDE written in Java from Sun Microsystems, and can be used for developing C/C++ code too. The package eclipse-cdt provides the Eclipse IDE with C/C++ development plugins. I found it slower than the others IDEs mentioned here, especially the interface. Both Emacs and Vim became legends on Linux and they both have fans who continuously argue on which one's better. I personally prefer Emacs over Vim, but I recommend you to try both and see which one fits you better. Emacs is not only an IDE, it's also an e-mail client, eventually IRC client, file browser and more. Regarding speed, Emacs is way slower than Vim, and as IDEs, both include great features. Both Emacs and Vim use their own concepts and keyboard shortcuts, so as a beginner you'll (probably) find them a little hard to learn, but this doesn't mean you don't have to use them. Put some effort into learning at least one of them and you'll see in time how helpful this learning process is. Another note: most systems (including web servers which you'll usually ssh to in order to manage your web page - if you have one) include Vim by default, but not Nano or Emacs. Update: As I already mentioned earlier in this article, Dev-C++ is not available on Linux, however if you really, really want to work in it instead of a native IDE, you can successfully run it through Wine. To install Wine either type sudo apt-get install wine (which will install 1.0) or to install the latest release use one of the following tutorials (they all work for Ubuntu 8.10, 9.04 Jaunty Jackalope and the latest Wine release): tutorial 1, tutorial 2, tutorial 3. After setting up Wine download Dev-C++ from here, and run wine devcpp-4.9.9.2_setup.exe to install it. Refer to this page to see what additional libraries you will need for running binaries compiled with Dev-C++. The executables will be located by default inside the ~/.wine/drive_c/Dev-Cpp/Packages directory, where ~ is your home directory. Have some other questions regarding compiling or using IDEs on Linux? Or maybe a correction or suggestion regarding this tutorial? Please feel free to discuss in the comments below. I think Eclipse deserves to be mentioned here. Thanks for mentioning it, I completely forgot about Eclipse. I think I'll make an addition and include it too, since it really deserves mentioning and it's a complex application. Just make sure you are using Sun's JVM. I started with Eclipse since that is what I used on Windows. But later I found KDevelop which currently rocks my C/C++ programming world. KDevelop is right at the sweet spot for me. Quite a bit lighter and faster than Eclipse and has almost all the features. Currently I'm also starting to learn Emacs. Yeah, I think netbeans deserves mentioning as well, it's easily one of the most advanced IDE's for almost every language. 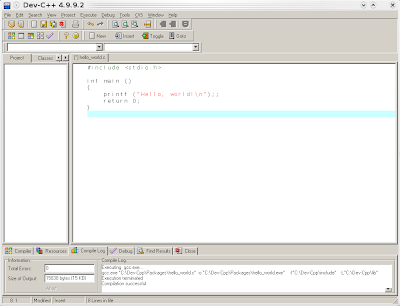 netbeans 6.5 beta makes eclipse look like a text editor. I tried using Anjuta for some c++ coding but I was never able to get it to work correctly. I'm definitely going to try some of these other compilers out. I would like to point out that both Eclipse and Netbeans are both originally designed to create JAVA programs but are both very capable of doing C/C++ with the correct plugins. Netbeans does know it's C/C++ very well. 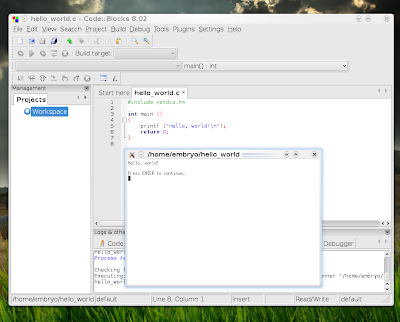 CodeLite C++ IDE for Ubuntu is the best I have used so far. It's still in beta. 6.1 has everything necessary to have fun: Java, C++, Ruby. 6.5 will add PHP. To my taste, NetBeand does jRuby better than Eclipse. Does the "bash:" mean that I'm using the bourne shell? Should I be using another shell? I use to be C programmer using an SGI version of UNIX. Once I compiled a program I was able to execute it from a command line just by entering the name of the executable - is this possible with UBUNTU? put a ./ in front of the command name. This is the location where executables will be searched for, and in the order they are listed. Thanks - your suggestion worked. I installed Anjuta via Add/Remove. Then after checking in couple of add-ons I finally made the Build Option come to live. But I simply couldnt make the drop down options to work, as they were disabled. This is first time with linux, so would appreciate any help. That's it, Code::Blocks ready to go, actually for me Code::Blocks is the best. KDevelop is just for KDE. Eclipse for C++ also very incomplete. Code::Blocks also accepts you to use any compiler (this is also in Windows) which means that you can just set to use Intel C++ compiler, or tne standard GCC. You're welcome Neelesh :-) Hope Linux will work OK for you. I have tried numerous IDEs in linux, but I think I have finally settled on CodeLite. Code::Clocks is pretty good, but CodeLite just seems a lot more polished. Thank you all for sharing these too. I updated the post accordingly. The link libcodeblocks.so.0 exists in /usr/local/lib so either its wrong or a ldconfg step got left out somewhere. Are you sure you did everything right? Did you run sudo ldconfig after the installation? I can't think of anything now... it worked for me. sudo ldconfig was left off your instructions for building codeblocks. It gives the error message I reported when you follow your recipe. sudo ldconfig is the final step which you left out of your instructions. Actually, IMHO it should be in the make install part of the makefile which is already being run by root. I recall finding a port of Dev C++ to Linux on FreshMeat. Good read. I'm just migrating over to Linux (Ubuntu) from a long time of developing on Windows under Visual Studio 6.0 up to VS 2008. The review of the various IDE's was a lot of help. You also forgot the KDevelop and/or QtDevelop and for persons that don't hate Mono, Monodevelop. All are integrated IDEs that do most work to you. hey i m on the idconfig part and when i press enter after writing "sudo ldconfig"...it says nothing...!!! now when i run codeblocks...its not able to comppile c++ programs....cant identify "conio.h"...!!! Help me out of this !! !